Bart Meuleman: Where does your interest in the theatre stem from? Lisaboa Houbrechts: It has always been there, I think. I always wanted to act, I wanted to be an actress. So I went to the ‘kunsthumaniora' [arts-oriented secondary school]. Lisaboa: In Hasselt. I did Wordcraft. But it’s a very different world. It has little to do with theatre. Bart: You have to start somewhere. Lisaboa: There I did have a craving to act with pathos. It was something I really needed to express. But then I thought: gee, this can’t be it. Bart: Were there actors or actresses you looked up to, who you just had to see? Lisaboa: No, not at that stage. It was more a personal need, something therapeutic, I think. I was struggling with lots of things and acting was a way of turning that into something positive. Things only really became clear when I started to take an interest in visual art, when the history of Western art was explained to me at the School of Arts in Ghent. But I was keen to do something with the Greek tragedies or with Shakespeare. When I went to look at theatre, I didn’t see that reason any more because there is so much ugly pathos in theatre. Visual art, which is more concerned with transformation and alienation, prompted me to start thinking differently about what theatre could be. Only then did my love of theatre really manifest itself. I knew I was not a visual artist, that I couldn’t do anything with my hands. An empty canvas meant nothing to me, a stage set did. Bart: Did your family encourage you to be creative? Lisaboa: My parents always thought it was interesting to see what I did. I wrote a lot, too, as a child. Of course I saw that they had imagination as well, but sometimes you are so trodden down by life that you can’t see a way through. That’s the case with a lot of people, including my parents, and they thought it was lovely and enriching to see someone grow up who was creative. Bart: Was there much culture at home? Lisaboa: Yes. My parents didn’t work in the cultural sector, but my father, for example, is a real film buff; he collects films. His film collection is still a great inspiration. He introduced me to Tarkovsky, Fellini and Bergman. Lisaboa: Sometimes just in one evening we will watch three or four Bergman films in succession. That’s a real journey. For me it was a way of escaping the anecdotal that was taught at school. Bart: Which is your favourite Bergman? Lisaboa: The Seventh Seal is very interesting – because of the medieval involvement. That grotesque acting, you can hardly look at it now, but for me there is great poetry in the simplicity with which things are solved. Stalling something, linking it, a set that turns into another set.... without it becoming technical or looking snazzy or modern. I love those poetical shifts. Bart: At a certain point you decided to go and study at the KASK [School of Arts in Ghent]. Why that choice? 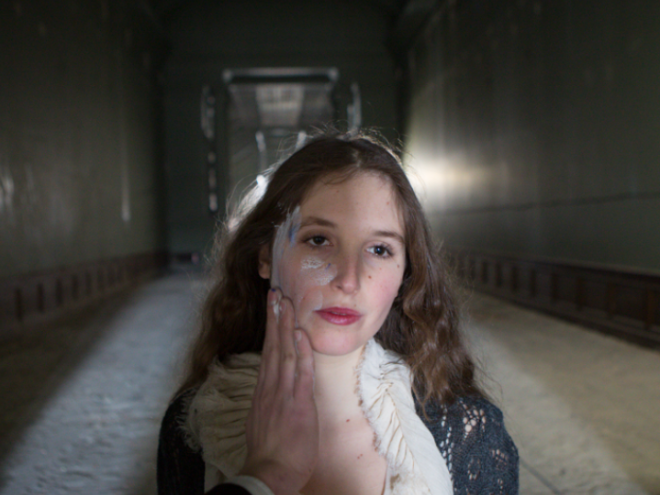 Lisaboa: I chose Ghent because the KASK takes a very physical approach to acting. At the time, I regarded the loose approach to a text, through improvization, as very important. But I didn’t compare the KASK to other schools. Bart: You didn’t want to go to the Conservatoire in Antwerp – the acting school? Lisaboa: I loved the atmosphere and the architecture in Ghent. When I was accepted, I didn’t ask any more questions. That is very naive. Lisaboa: I just wanted to act. I wanted to get rid of all those emotions. Sam Bogaerts told me later that it was the reason I was accepted. He felt there was a lot of drama in me. I had no idea what I should do with it. Bart: And you don’t even really like drama? Lisaboa: I do like drama: I choose Shakespeare because I find the drama so interesting, but I also have a problem with it. It’s a love-hate relationship. I don’t really know how to deal with it. I often make it a theme in my work. Bart: Could you say that you are attracted to drama, but that you look for different ways of shaping that drama? Lisaboa: Yes, personal ways. Not something you can think up in advance. You have to enter into the drama of the play as a whole and go through that ugliness. Have the actors act very dramatically just for a couple of weeks, then you switch to something else. And each time the drama is different. It is never something you can learn from. It’s not that I now know how to approach a drama about the Middle Ages because I’ve done Shakespeare. Bart: What was it like arriving at the KASK in Ghent as an eighteen-year-old? Lisaboa: My main memory is one of loneliness. You suddenly find yourself in a drama class having to perform with each other. That is very intense, but there is a real sense of coldness towards each other. The KASK did have something to offer. I got a lot out of the appreciation of contemporary art and history of art lessons, especially when it was about Louise Bourgeois, for example. Or Marcel Duchamp and conceptual art. I recognized so much in it, so much more than when I had to work myself into the ground moving and dancing. I could lose myself in art. Over the years Sam Bogaerts was my mentor, but we had our ups and downs. Only in the last couple of years did he become really important for me. To start with, I didn’t even know who he was. Later on, he would say things and I would think: yes, I guess that’s right. Bart: Give me an example? Lisaboa: He said I should shave off my hair to become a better actress. And he asked me why I took such care over my appearance. “Why don’t you ever come to the KASK dressed in your pyjama bottoms?” He believed that a lot of things get in the way of acting, which I completely understand, but I found what he suggested – like shaving off my hair - slightly ridiculous. So that was difficult. It hadn’t really found my way. Then Sam said: “Why don’t you try making something? Because this isn’t just an acting course. It should also be a creative course, only it’s not in the curriculum yet.” And I thought: yes, I’m going to try that. Lisaboa: In my second year. Bart: What happened in the first year when you had to act and move. How did that feel? Lisaboa: There was too much in the way. Bad anecdotes. Poses. I had been ‘malformed’ by secondary school. When I saw someone else do it, I could recognize it immediately, but by myself I didn’t really get it. Because I had never studied text. And it wasn’t given much weight at the KASK either. We read a Shakespeare together in a reading room but there wasn’t much opportunity to ask yourself what was really there. I taught myself to do that. And then I decided: I’m going to do something with what I read in Shakespeare. Bart: Things may not always have been easy with Sam Bogaerts, but he did continue to support you, didn’t he? Lisaboa: He always put new opportunities my way. He saw all sorts of things in me and sometimes he was disappointed when it didn’t work out. I really think he understood my problems; he made suggestions, which I then declined but which did result in something. It was an intense battle. But it wasn’t Sam who helped me through it in the end. It was Victor Lauwers, who was studying film at the KASK at the time. Oscar van der Put, who now makes our sets, did the sound for those films. And I acted in them. Victor could really talk about acting in films, and that was a huge inspiration for me. He could find a link with everything I saw in the history of art. He also found links between his films and visual art. Suddenly those things came together. It was Victor who helped me to trust myself. Bart: Were any other teachers really important for you in those first two years? Lisaboa: Not many. You did have Frank Maes who taught appreciation of contemporary art. I didn’t have any personal contact with him, but I got a lot out of his lessons. The way he guided us through modernity, starting with Bruegel and ending with Duchamp, was more important to me than practical lessons. You had Jan Steen, of course, but he only came after Sam left the KASK. He took over Sam’s ‘father-figure role’, if I can call it that. He was more accepting of different opinions in the school, which was interesting because we had hardly any visiting lecturers. Bart: So the first time you made something was at the end of the second year? Lisaboa: Yes, the brief was: no scenery and no costumes. I am more a baroque type. My productions are really a study of what scenery means, what costumes mean. What do you do if you can’t use any of that? As an actor, I was completely lost, but as a maker I could do something with it. Bart: So you were allowed to make something, but without scenery and without costumes? Lisaboa: Perhaps you could have done but, for some pedagogical reason or other, I was advised not to. That was a play with two actors, Benjamin Cools and Diede Roosens, and I covered them with a sort of gunge. They were almost naked, and half-way through the show they started scratching and it all fell off. They could also eat it. But it looked as if they weren’t wearing costumes. I was on the stage, too, but as the narrator. I did the voiceover, and they moved to what I said. Bart: What was that production called? Lisaboa: It didn’t have a title. Bart: How was it received, by Sam for example? Lisaboa: He was very enthusiastic. Bart: Was that a turning point? Lisaboa: Not yet. But it was a first step towards observing and working as a director. Lisaboa: That summer I got to know Victor, Romy and Oscar. Bart: Was Oscar at the KASK too? Lisaboa: Oscar was studying painting in Den Bosch. Victor was going to make films; we made four films together. Those filming days were very intense. For three days we talked non-stop about what acting is, what a film is. Films work differently from theatre. Acting in a film is perhaps more anecdotal than acting in theatre. Victor had a very beautiful abstract script, inspired by the symbolists and decadence. Suddenly acting came to me more easily because I was engaged in the process as a maker. I almost had the feeling that as a director I might do something in front of the camera, to illustrate it. Things began to fall into place. Then we read Tarkovsky’s Sculpting in Time. The way Tarkovsky talks about the almost metaphysical experience of film; what is time? what is editing? I gained momentum. Then I got to know the Needcompany. I had followed their work, but suddenly I got to know Victor and Oscar. Romy was there as well, she was in The Market Place. I was allowed to go and watch a rehearsal of The Market Place in Anne Teresa De Keersmaeker’s studio. I hardly dared go in because of the noise. That anarchy, that music, I had never seen anything like it at the KASK. You had the concert, and then Romy’s performance. She was younger than me, an extremely attractive person to see and to follow. In the midst of a company that has been around for years, she held her own. I went and sat on the side and I watched Jan direct, as Victor directs his films. And when I saw Romy standing there like a sort of mirror, I knew my place was not on the stage. Bart: So that summer was very important. Lisaboa: It might have been April, that period. We travelled a lot together and visited exhibitions. Most important for me was probably Documenta, and the work of Pierre Huyghe in particular. His video The Host and the Cloud and his installation of a bee-headed woman made a great impression on me. I still have Huyghe’s work lying on the table when I make something or write. I also found the work of Tino Seghal and Francis Alÿs extraordinary. Bart: So after that summer you could or had to choose what you wanted to do at the KASK. The lessons were more individual. That suited you very well. Lisaboa: It was important mainly because theatre or your development was sometimes talked about at the KASK in a way that is not very stimulating. You just have to go and find an educationalist, someone you look up to. He has to see you do something, see you working on a larger scale. At drama school it’s all about you, there is no bigger thing. The bigger thing is the class, with students who are all trying to do well and eye each other up with a degree of coldness. Bart: So those three people were more important to you than the KASK? Lisaboa: Absolutely. It started with someone saying: “You can do it.” That is so important. Then you surpass yourself just because you want to. It’s not about a school, it’s about you. For me it was a way of being part of what they were doing. It’s a way of thinking and a way of living. I really wanted to be part of that way. That’s why working and living at Kuiperskaai are so interconnected. We had erected tents in our workshop and I remember Oscar saying: “We’re going to paint those tents.” Suddenly your tent or your ‘sleeping pitch’ had turned into a work of art. The next day we said: “We’re going to organize an exhibition and Victor is going to write a text about that exhibition.” Not a manifesto, but a very eloquent text about abstract painting. I said: “I’m going to do a performance in the exhibition.” That’s how I came to make my first show, with people from the KASK. So with fellow students. Only then did I start to invite people. Only then are you proud to invite people into your own house, which is also a workshop, an exhibition, a place of theatre. Bart: I should really ask now what you did there at Kuiperskaai, then what you did at the KASK? Lisaboa: That year at drama school was difficult. No, actually it was a nice year. Sam Bogaerts was very enthusiastic about Kuiperskaai, but not everyone at the school shared his opinion. At first they didn’t understand what it was. If I made a work with Kuiperskaai, did that count for the school? That was the big problem. Bart: Why couldn’t it count for the school? Lisaboa: Whose authorship is it then? That was often the question at the beginning. What does that mean, those people living and working there together and mounting exhibitions and making some strange performance that is much too wild with lots of scenery and lots of costumes? Next thing is you’re at school with the idea of sobriety. I didn’t pass everything in the second year, but I did want to do everything that third year. I had gained momentum, artistically speaking, and they felt that too, I think. They appreciated that after that one summer I was quite a different person. Then I made De Schepping (The Creation, 2013), a very big work. Bart: With Kuiperskaai. And with other people too, I assume? Lisaboa: With students from the KASK and a female dancer from PARTS. That was really.... incredible. That is still one of the projects closest to my heart. Also difficult to make, with musicians who suddenly pulled out, that sort of thing. The initial inspiration was Rimbaud’s Une saison en enfer. But I had also seen Tarkovsky’s The Mirror with my father and I was so impressed. That mother who becomes the wife, and the son becomes that father... All those mirrors. Suddenly I thought: if you find a method of writing a hermetic script, you can make something that goes way beyond the anecdotal. Or as Tarkovsky put it: you have to place things/people/spaces in a poetic logic, they should be linked in a non-rational, almost ritual way through the montage. Then I wrote a long and complicated script about a Russian poet, Andrej, after Andrei Tarkovsky. He was called Andrej Fjodorov, like the cameraman in The Mirror. Those images are so beautiful. It was a play about a Russian poet who goes mad and about the goddess of madness, who rose up out of all the pain and sorrow of the Second World War to deceive that man in his private world. Totally crazy. I wouldn’t write anything like that now. But at the time I had nothing to lose. A whole Sturm und Drang-like thing. There was a lot of screaming. And all those naked actors. It was an incomprehensible, disconnected story. But there was something in it. Some people were angry, some walked out. I had really made a statement, I think everyone felt that. Some were with me, others were not. That was a real watershed moment. Only then did I start to develop as a director. Bart: After that you also had the chance to work with Romeo Castellucci, I understand. Lisaboa: As a performer, in the Natura e origine della mente project for the Venice Biennale (2013). Castellucci designed his theatre as a visual artist would, and that was inspirational and even recognizable, but also confrontational. His actors were mere objects, the emotions we had to act were reproducible, traditional almost. As a performer I felt something was missing. It changed the way I think about combining different media in theatre. I saw exactly what I didn’t want. That really influenced my own work. Bart: And the fourth and last year at the KASK? Lisaboa: That was very unclear. I had to repeat the third year because I still had subjects from the second year. I had made an arrangement with Sam Bogaerts, but Sam was obliged to leave that year. He is still very angry about that because he was really the father of the course. Suddenly Sam had to leave and Jan Steen took over – which he did very well, but Sam had gone. De Schepping didn’t count as my graduation piece. I had to do the drama project again, so De Schepping was not my ‘masterpiece’. By that time the KASK wasn’t so important to me so I didn’t mind. Bart: So you had to make a new production. Lisaboa: Yes, but first we performed De Schepping in Scheld’Apen, a gigantic shed. Up until then we had only performed it at Kuiperskaai – so in a small space. Only then did I realize what the large stage is. In the space of two days we transformed the play for that very large space. Suddenly everyone understood the production much better because you need distance. You need to be able to see the pieces of scenery autonomously. You need to be able to look at a plinth with an actor on it autonomously. On a large stage you can isolate everything and music is created. It should all become part of one large tableau, as with Bruegel for example. I was already finding inspiration in Bruegel, as indeed I still do. The concurrence, how things come about. When I see Bruegel, it’s as if I’m reading a piece of music. Only then did I understand all those different centres in my work; only then did I realize that I think about sets more as a visual artist, that I think about musicality and about images. That’s when I understood that you make images with text. Then I made The Goldberg Chronicles (2014). Bart: That was while you were repeating the third year, wasn’t it? Lisaboa: A nice play. All those images come back to me now. That was with Lobke Leirens and Seppe Decubber from the KASK – two inspirational actors I have continued to work with. The play was about Russia again, this time about a Russian woman. A Russian fur trader is posted to Germany, where he runs an illegal fur business. His wife shoots him dead after a traumatic experience with him, and she holds the Belgian government responsible for it. At the end of the nineteenth century you had a very interesting situation in Belgium. The fur sector in Brussels was run by four or five big families, and one of those families was the Goudenberg family, so Goldberg. There were links between the Jews, the First World War, Brussels and the Russian fur trade. Again I wrote a really complicated script. It was mainly about Louise Goldberg, who Louise Bourgeois had inspired. It is about being a woman, what it means to be oppressed. Louise Goldberg was a really terrible woman, not a nice character at all. Bart: Just as Louise Bourgeois probably wasn’t a nice woman either. Bart: I felt I could understand The Winter’s Tale (2016). It wasn’t an ordinary approach to Shakespeare, but I could certainly follow it. Lisaboa: Yes, but Shakespeare wrote it. I wrote those other productions. That’s why I wanted to do Shakespeare too. The family is always central, just as it is with us. And Shakespeare is also very complex, but he always makes things clear. What do you need for that? As a writer I needed to edit Shakespeare to see how he did it, how often he repeats himself to make the story clear. Bart: You made The Goldberg Chronicles in that third year and after that you made The Winter’s Tale. How important is clarity for you now? What are your conclusions after those two different shows? Or isn’t it really so important? Lisaboa: Oh, it is. The difference is that Shakespeare wrote a story from A to Z and was not that concerned about alienation. When I wrote The Goldberg Chronicles, I was already thinking like a director. As a writer I didn’t accept the drama completely because I wanted to alienate it. I was already inserting images into the script. In my own scripts image is sometimes as important as text. Sometimes I write whole passages of text and then insert an image. With The Winter’s Tale I spent a long time trying to make a sort of ‘decalage’, a time-lag. Not because of the deconstruction but to get that drama told today. I thought, I must alienate it. And then I realized I didn’t need to. For me that was important. I must yield to that drama, to that sentiment. Then it alienates itself. Provided there has been some intervention. I did approach The Winter’s Tale more as a dramaturge and as a visual artist, though I don’t have a background as a visual artist. Strange as it might sound, I want to stage a text like that as a visual artist, and as a dramaturge I want to reflect on the tensions and the conflicts, on how people have to act. I want to continue with that in the next work and wait a while before writing it. There is still too much conflict in me between directing and writing. Bart: What are your plans for the future? Lisaboa: We’re going to make 1095, a play about the Middle Ages, written by Victor. The script is ready and we have two months to knock it into shape. I’m now having a very intense dialogue with Oscar. He’s working on the set as a painter. It’s very productive to work together with the same people for a long time, however young we may be. I started talking to Oscar about what a set is when I was twenty and five years later we are still talking about the same things, but in a different way. Wonderful! Bart: Do you sit down with him beforehand and think about what the production will look like? Lisaboa: We read the script and look at possible ways of making things autonomous. Of making images. Text can also be autonomous. I am always looking for the autonomous. For example, in a particular scene, someone might have no text, whereas it would be nice if they said something. So then I have a piece of music written as an answer to that text. That’s how I take the text apart. Actually, I make a new script. Bart: You are given a scenario and you make it into a screen play. Is that it? Lisaboa: I go looking. I piece things together. When I hear Maxim Rouquart make music, I think, ah yes, perhaps that should go there. Or I see Oscar create an image... We have a beautiful image of a tree. Oscar draws that all in white on the iPad so that the tree becomes abstract. When Mondrian talks about the abstraction of ordinary things, I’m inspired to see what a tree with water behind it could be. I look to see where I can place it. Or I ask myself if it could be about death. The designers constantly come up with suggestions. Bart: Do they expect their work to remain autonomous? Lisaboa: They make suggestions because I take them with me into the world I want to make. Bart: So you work in a certain spirit, but autonomously? Lisaboa: Yes. For example, we think about what the Middle Ages were, what a fantastic experience that must have been. When I see how they drew fish then. Or the idea that there were wood spirits. Or that there was no artificial light, just candlelight. How do you experience a day or a night then? You experience ordinary things in a very different way. So we discuss all this in advance and then they design. I walk round constantly, I often go and take a look. Every day that throws up another idea, but eventually it comes together. It does have to be clear to me before the actors are there, because the actors have to come into a universe. Bart: And looking slightly further ahead? Lisaboa: We’ll do another Shakespeare, Hamlet. We are completely focused on the mother-son relationship between Grace Ellen Barkey and Victor. Romy will be on stage, too, as Ophelia. I want to home in on the family. That is intrinsic to all my work. That’s also why I chose The Winter’s Tale. Bart: Is the family a prison? Lisaboa: I wouldn’t say that exactly. But there is something very dark in a family. You can do terrible things to each other. Bart: You can go on doing them because you can’t really be separated from each other. Bart: And if you do free yourself, then it’s in a negative way. As if you’re saying: “From now on you or you can’t be part of this.” So it is there as a negative presence. Lisaboa: It’s not that I regard families as being so black, you know. But I am always looking for darkness, in myself too. Moving ever closer to the border with madness. I think that with Hamlet I have now grasped the essence of what I was working around all those years. In terms of content that is, not yet in terms of form. Formally, I want very different things. Bart: Where would you like to go in the longer term? Lisaboa: First and foremost I want to start my work from Kuiperskaai. We are more than a theatre company. We now have this new space in the Mill. We don’t rehearse here alone, it’s an open workplace. We want to invite people here, mount artistic projects, make exhibitions, rehearse. Above all, I never want to be constricted. I never want to say: I am now becoming that person who is only going to do this or that. I would like to be generous and in that generosity make very good work. Bart: So do you think that the group of people you want to work with will expand in the longer term? Lisaboa: Yes, but there will always be a core. For me that core will continue to be us four, Kuiperskaai, plus our regular actors, Lobke Leirens, Maxime Rouquart and Seppe Decubber. We have now gathered a few people around us like Matthias Van Dromme and Pauwel Hertmans. I think it’s wonderful to reflect on what it means to do this as a business, too, to discover systems. In terms of policy, you can come up with a system and see how you can approach it artistically. Bart: So really you always want to be able to question every part of the process?